1. You can reach the Érsekkert on foot from the direction of Klapka, Hadnagy, Deák Ferenc and Szálloda Streets. You can park your car near to the venue: at Ady Endre, Hadnagy, Klapka, Csákány Streets, and at the parking lot at the entrance of the Stadium. 2. If you are visiting the event, please do not hurry, take your time, relax, enjoy the atmosphere and talk to your friends ans acquaintances. 2. Choose suitable clothing and shoes for the green milieu of the Érsekkert. 3. If you happen to feel like having a picnic, bring a blanket so you can lay down in the grass and enjoy the wine and food the festival offers. 4. If you do not like standing in lines, or crowds, you can always arrive early. 5. It is wise to plan ahead; take a look at our webpage, or Facebook page and choose what you would like to see. 6. You can buy a cupholder that you can throw over your shoulder. This way you can use both your hands while walking around and it will also be easier to eat. 7. Do not get too greedy when it comes to wine; it will soon make you feel light-headed, especially in the heat. 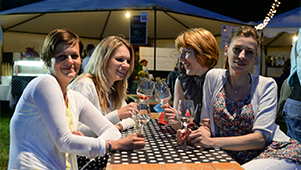 There will be enough time for you to taste everything, it is advised to try different wine brands on different days. 8. To wash off the taste of one wine, you can drink mineral water. They will be selling it at every stand. 9. While tasting food and wine, please be attentive: do not pour wine on other guests! 10. 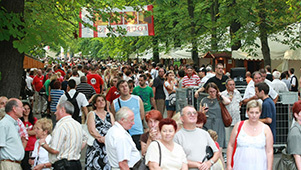 The Bull's Blood Festival is a great opportunity for you to get acquainted with the wine culture of Eger and its surroundings. Please try the meals that we offer, so you can enjoy them together! 11. Please do not drive home after the wine tasting, choose another form of trasportation! 12. We offer programs for children as well, so do not leave them at home! They can visit the petting zoo, the playground, and they can also participate in various programs, see some tractors and taste delicious candy! 13. 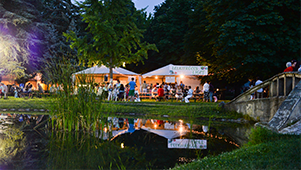 In addition to wine and food tasting, you can enjoy many different musical and cultural programs at the festival! 14. In case you would like to donate blood at the Festival, please bring your ID and TB cards with you! You cannot miss the best Bull's Blood Festival ever! Come to the Érsekkert on every day of the event and share the experience with us.